This summer was the summer of weddings for Roger me. 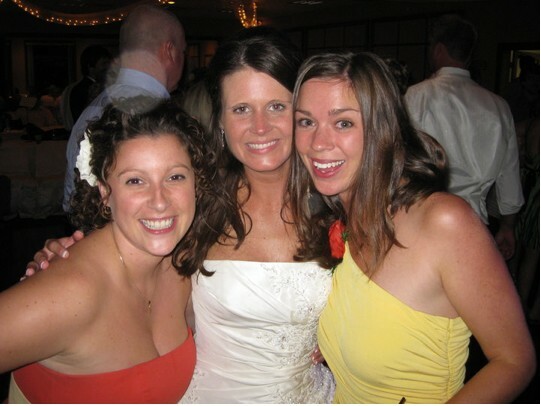 Many of Liz’s high school friends as well as her cousin were married over the span of the last four months. As I attended each wedding I secretly wondered if Liz was present … I always felt she was … although an outward sign as proof seemed like too much to ask for. However, as I sat by the shores of Pelican lake and watched Suzy, Liz’s cousin, marry, I began to ask Liz for a butterfly so that I would know for sure that she was there. This was a joyous wedding, but it also brought home the fact that Liz is gone and we will never get to experience her wedding day. It was bittersweet and I was filled with mixed emotions. I didn’t see any butterflies during the service … I was disappointed, but I reminded myself that you just don’t always get what you ask for. I put it out of my mind and enjoyed the beauty of the day and the fun and joy that the reception held. What happened next was indeed a very pleasant surprise. Numerous people came to me and asked if I had seen the two butterflies that were flitting around during the ceremony. I was very surprised to learn about this, since I had been asking for just such a thing to happen, and it did … but I just didn’t see it. No matter, it happened and there were several people who saw it and realized the significance. I started to laugh – it wasn’t a ghost – it was Liz. Once again, visual proof of her presence on one of the most important days of her friend’s life.